Come and play it if you dare? Club Intramuros Golf Course, would have to be one of the most unique golf courses in Manila, well come to think about it, probably in the Philippines. Not only is it in the center of Manila, but you can play it at night! Where else would you be able to play a round of golf at night after work? 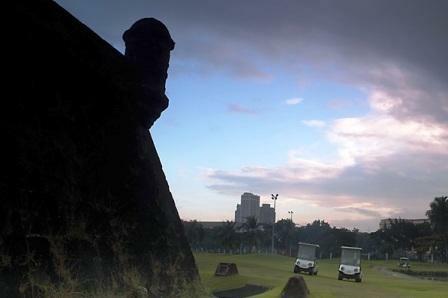 This golf course in Manila is said to be the oldest in the Philippines. Built in 1907 by the US, it is within the walled city of Intramuros, another little quirk of the course. It is an 18 hole par 66 golf course, so it is not very big, but it will test your short game, specially your accuracy! It is very popular with tourists, have a look here for tee times, you can even book your round here, you would not want to miss a round at the Intramuros Golf Course. 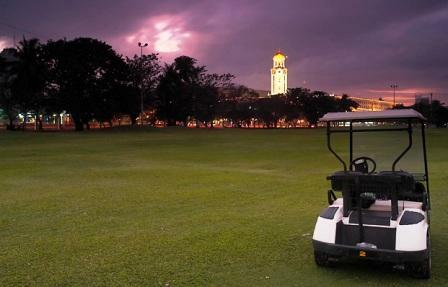 The Intramuros Golf Course is a little oasis of calm, surrounded by the madness and hustle of the city of Manila, but don’t think you will enjoy the calm for the full 18 holes! You will have to travel across one of the streets to continue your round, this is where the madness begins, it is madness after playing golf, well maybe depending on how well your hitting the ball, perhaps the chaos of the road will put you back on to your game. Luckily the serenity returns in a couple of minutes. Playing the Club Intramuros Golf course needs a bit of finesse, it is not a course for long hard hitters, in fact you will not need your woods at all. There is only one par 5 hole which is 428 yards. The course in total is about 4,326 yards long. There are a lot of hazards dotted all over the course, from water and sand traps to the odd wall, yep just like the one in the above photo! You will loose balls if you hit too long and too hard, poise and subtlety is what is needed at the Club Intramuros Golf Course. Okay, do you feel like a quick round, whilst you are in Manila? If you do have a look here, for some great rates and tee times.